"I am the wrong person to have discovered this." 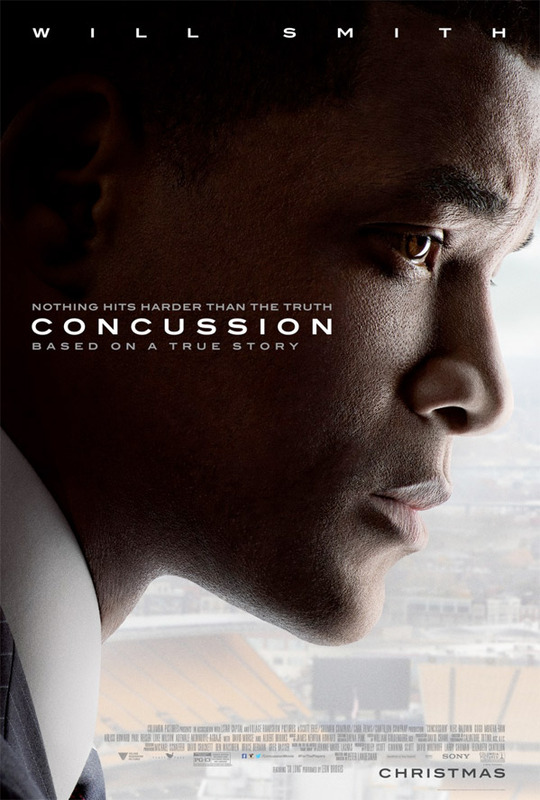 Sony Pictures has debuted a fantastic new trailer for Peter Landesman's Concussion, the upcoming powerful drama starring Will Smith as Dr. Bennet Omalu, the soft-spoken neuropathologist who made the first discovery of CTE, a football-related brain trauma. This story is controversial just based on the subject alone, and the way these trailers seem to indicate that the NFL didn't like what Dr. Omalu was discovering with his investigations. The cast includes Alec Baldwin, Albert Brooks, Gugu Mbatha-Raw, Stephen Moyer, Eddie Marsan and more. This looks good, but there's something a bit wonky with this trailer. Still looking forward to seeing Smith at the top of his game. You can still watch the first official trailer for Peter Landesman's Concussion here, to see more footage. What a misleading description. CTE has been around since the 1930s. All this guy did was determine that in fact NFL players were suffering from it. CTE isn't limited to football and it sure as heck wasn't discovered by this guy unless he time traveled. Political correct nonsense. You make it sound like what they knew in the 1930s is the same as what we know now. That's hardly the case, the difference is night and day. Wow. This movie looks very good. It really makes me want to go find out more about the true story. Frankly, it always surprises me to see how good of an actor Will Smith turned out to be. I'm not sure I understand this comment. Smith, when he's in the right roles, is one of the better actors out there. Bagger Vance, Pursuit of Happyness - that movie alone is worth giving him all of the praise, Ali was a pretty good performance, Seven Pounds was great. He makes bad choices but his best choices are leagues above most others'. Two comments citing excellent Will Smith dramatic roles are proof that Will Smith is not a very good actor? That logic I don't follow. Pursuit of Happyness was really good. His Igbo (Nigerian) accent is shite, but I know the source material is really interesting. Hoping this turns out well!